It’s my last post in the How to Wear Overalls series (part 1 // part 2 // part 3 // part 4). The weather has been amazing the past two days and I am soaking it up!! Nothing is better than a day out in the warm sunshine after being frozen all winter long. 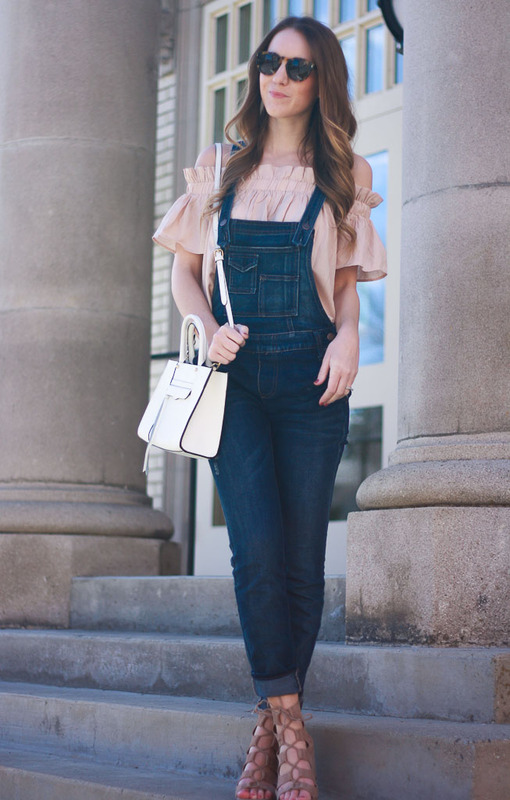 One of my favorite ways to wear overalls when the weather warms up is with an off the shoulder top. This blush option has been one of my favorites lately…because duh, it’s blush! It’s such a fun, easy spring or summer look. I paired it with my current favorite wedges. If you are looking for a good pair of wedges, these are it! They are so comfortable and I love that they lace up! I’m heading somewhere warm and sunny tomorrow! Follow my adventures on instagram @twentiesgirlstyle! 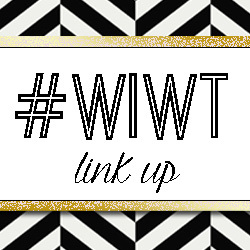 This weeks featured blogger is.. Eat Pray Wear Love! This girl knows her stuff. She pulls every every color and every style! We especially love how she paired these heels with her ripped jeans and top! Cute outfit for GNO – Have a wonderful weekend! so beautiful! love the overalls and the top! Girl, you are rocking those overalls! I just love that top, though! The shade is perfect. Thanks so much for having me co-host today! I just love your style!! Pinning this! I have been eyeing that blush top and it may be time to pull the trigger. This is so cute and creative! You make me need that blush top! Super cute outfit. I'm thinking about getting a short one from Urban Outfitters. Love how you styled it. Turned out amazing combination of coarse overalls with an elegant blouse. keep it up! You look fantastic – so girly and pretty! I love denim with light pink. Great sunnies, too! oh my gosh, you look so cute! 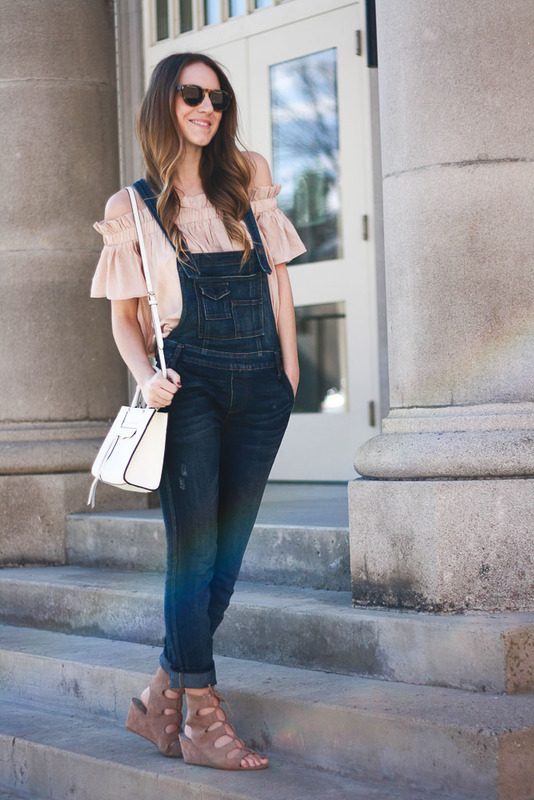 I reallllyyyy want some overalls and I think your post just convinced me that I must get some! I am so crazy about your overall styles, you've really convinced me I need a pair! You can totally rock overalls!! Also I just got that RM bag and can't wait to wear it after seeing it on you! Love your outfit, its so pretty!! Okay this series has definitely convinced me that I need to get myself some overalls. I think they're so cute and probably so comfy too! This is such a cute pairing! I love overalls, I could never pull them off so just loving seeing people rock them. Now I seriously have to find overalls to go with my off the shoulder tops! Love this look. This look is so trendy, but it works SO WELL. Love it! I love that!! I need it. You look gorgeous!! I'm SOOOO into this new overall trend. Love the pics! I love how you styled these overalls! So girly and fun, I definitely want to get a pair! Oh my goodness! I think this is my favorite overall post from you 🙂 I am officially sold on overalls now! 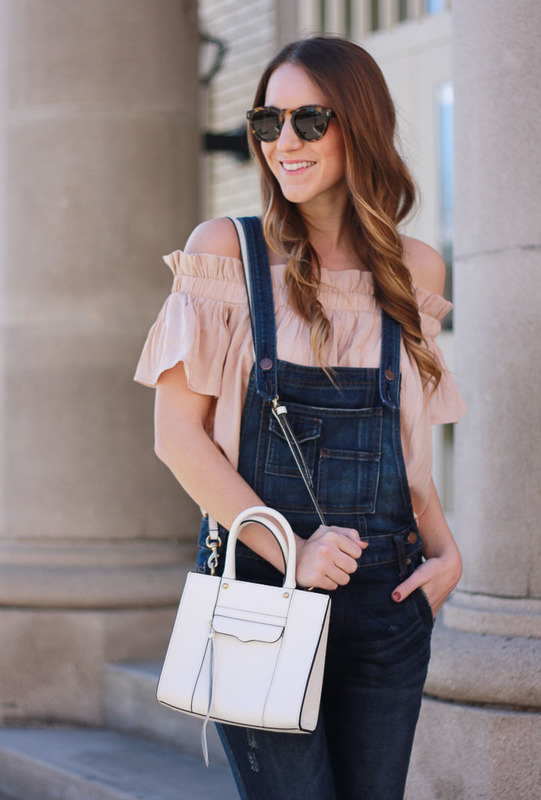 Loving the overalls with the off the shoulder top! How chic and so on trend! Ashley, I love your style and the fun and fashionable way you can rock a pair of overalls. When I saw your blush top, I was super enamored with it. That is one of the cutest off the shoulder numbers I've seen. I just purchased two cute ones here in California, but they don't hold a candle to the one you're wearing. Thanks so much for providing awesome sprinkles of fashion inspiration! 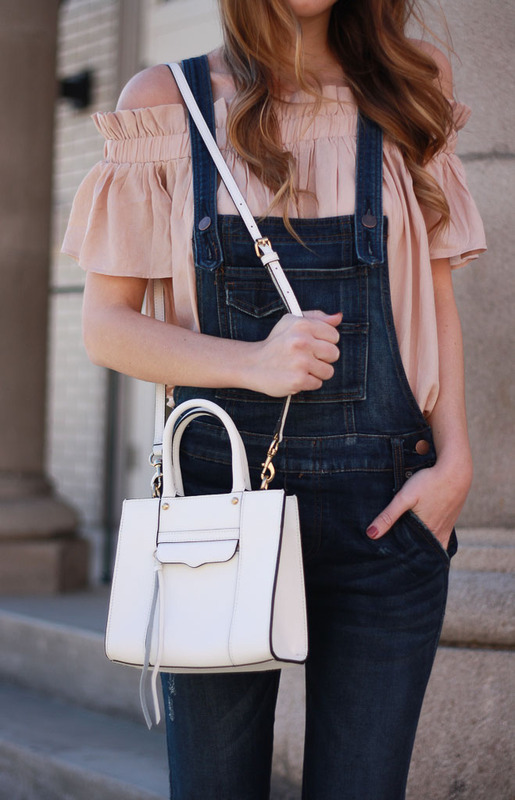 Off the shoulder + overalls… That's the most perfect combo ever!! Loving this look. I'm beyond obsessed with OTS tops and overalls! Super cute! 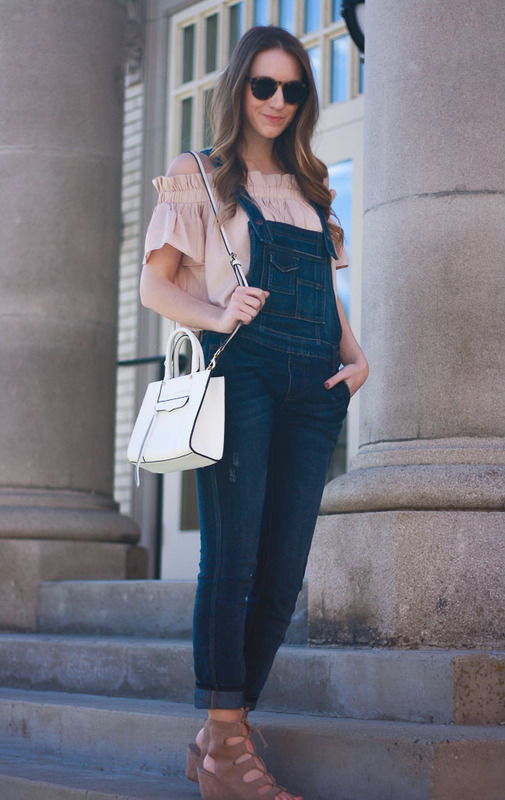 What a fun way to wear some overalls, I would have NEVER thought to pair them with an off the shoulder top! So cute! I love the pocket detailing on these! So cute! Love this look, you're adorable!